Glycerin , Prunus Amygdalus Dulcis (Sweet Almond) Oil , Prunus Amygdalus Dulcis (Sweet Almond) Seed Meal , Avena Sativa (Oat) Kernel Flour , Citrus Aurantium Dulcis (Orange) Peel Powder , Rosa Damascena (Rose) Flower Oil , Carya Illinoensis (Pecan) Shell Powder , Citrus Grandis (Grapefruit) Seed Extract , Myristica Fragrans (Nutmeg) Fruit Powder , Eugenia Caryophyllus (Clove) Flower Powder , Citrus Aurantium Dulcis (Orange) Peel Oil , Tocopherol , Rosmarinus Officinalis (Rosemary) Extract , Fragrance. 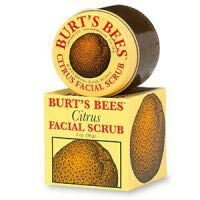 cleanses softens exfoliates (gently) leaves residue I've used this for a while, and really love it. I use it a few nights a week, whenever my skin is flaky or dry. Its super moisturizing and leaves a filmy layer on your face afterwards. I thought that was weird at first, but now its nice because its like a little moisture barrier. Anywho, I use this and sometimes follow with Cetaphil cleanser and it makes my face feel soooo smooth.